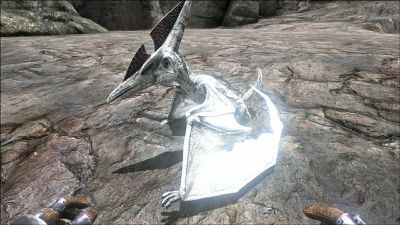 The Pteranodon (tear-ran-uh-don) is one of the Creatures in ARK: Survival Evolved and the first rideable flying creature available to players. The Pteranodon is skittish and not aggressive whatsoever, and will fly away when attacked. However, if an egg is stolen from a Pteranodon, it will become aggressive with an average aggravation range. The Pteranodon is a common sight on both the beaches and the interior regions of the ARK. It has a long crest and beak filled with needle-like teeth, as well as impressive wings, which bear more resemblance to those of a bat than those of other Pterosaur species in the ARK. This section displays the Pteranodon's natural colors and regions. For demonstration, the regions below are colored red over an albino Pteranodon. The colored squares shown underneath each region's description are the colors that the Pteranodon will randomly spawn with to provide an overall range of its natural color scheme. Hover your cursor over a color to display its name and ID. For example, "cheat SetTargetDinoColor 0 6" would color the Pteranodon's "patterning" magenta. The following are variants of the Pteranodon that are summoned by the Dragon. The variant summoned is dependent on the difficulty of the Dragon. These Pteranodons have higher Health and are Aggressive. 6The TamedBaseHealthMultiplier (TBHM) is applied right after taming, before the additive bonus is applied). The Pteranodon will flee as soon as it is hit, which makes it difficult to knock it out from the ground. But thankfully it can be immobilized with Bolas beforehand, which makes it easy to capture any Pteranodon while it is on the ground resting. If you spot a good target wait for it to fly down, then use the Bolas and knock it out before the effect wears off. A standard Electric Prod will instantly knock-out any Pteranodon that is level 120 or lower if hit directly in the head. This is arguably the easiest method to take one out, however the Prod is expensive to recharge. The Pteranodon will easily fall unconscious, but be cautious with your knockout method, as Pteranodons, especially lower levels, have low health and take extra damage from ranged attacks, making it very easy to accidentally kill one with a tranquilizer arrow or even a stone. Even high-level Pteranodons can often be knocked out with just one arrow. Also the Pteranodon can accidentally fall into deep water and drown, so make sure that you do not knock it out over bodies of water. Will only move forward upon command. With no forward command issued they will eventually stall to a halt and hover in mid-air. Even while not moving Pteranodons lose a small bit of stamina just to stay aloft. Feeding Stimberry or Stimulant to a Pteranodon in-flight can allow you to fly for longer periods, but the stamina gain is minor at best and very inefficient. Landing is accomplished by pressing the jump-key (default space, , ), causing the mount to move to the ground and land, where your Pteranodon folds its wings. Now you can unmount by pressing use (default e, , ) as with any other mount or walk on the ground. To start off again, press the jump-key (default space, , ). To perform an aileron roll, press the crouch-key (default c, , ) while flying. This gives a short speed boost and causes the mount to do more damage but also depletes more stamina. To stop in flight press and hold (default x). This section describes how to fight against the Pteranodon. Wild Pteranodons will only become hostile if a player steals their eggs, so they are generally not much of a threat. If hoping to kill, the player should start with critical head damage, as the Pteranodon will not get spooked even if the player is pointing point-blank with a shotgun. The same goes for taming. Get your first tranq in the head so it takes a quicker effect. Follow with a quick volley to spike the torpor before it goes out of range. Wait until they land to get a clear shot while they are trying to get their stamina up. They are extremely vulnerable at this time. If they are flying, wait for them to come down. If one has a sniper, they may try to get a powerful headshot while it is in the air. A Bola makes this easier. Any Ranged weapon will do the job. Quick pike and sword attacks can dispatch lower levels. There are no real dangers with a Pteranodon besides watching out for other aggressive dinosaurs while chasing or killing one. Non-bullet ranged weapons deal more damage against them so it is best to use a Bow or Crossbow. They also run out of stamina, forcing them to come down into firing range once more. *Scouting: The high speed of the Pteranodon makes it a perfect mount to scout the environment or travel around the map, or to farm Beacons. Their speed lets them easily outrun Argentavis and Quetzal, and their roll attack can be used to move faster at the cost of stamina. Level up in Stamina and Weight. *Mining Transport The Pteranodon cannot carry much, but its speed and ability to fly over dangerous lands and hills still makes it a decent mount for bringing back valuables. However the Argentavis - while slower - is able to carry significantly more weight. Level up Weight, add Stamina as needed. *War/Damage: Despite the Pteranodon being a speed mount, skilled riders can roll through enemies to deplete health and destroy Flak armor, although it may be forced to land frequently. Its ability to grab people mid-combat can also shift a fight to your favor, but keep in mind that a player, while grabbed by the Pteranodon, can still hit it and possibly kill it. Level up Health, Damage, Stamina and a little Weight (for carrying higher level gear). *Fighter Plane Squadron: The Pteranodon is exceptionally quick and agile in comparison to other flying mounts, especially after the nerf to fliers that removed the ability to increase travel speed. The Pteranodon's smaller hitbox and frantic movements also make it difficult to hit by both animals and firearms unless it's an autotracking weapon like an Auto Turret. A Pteranodon flown by a skilled rider along with several AI Pteranodon fighting alongside can easily overwhelm a Quetzal siege platform or Argentavis riding raider, with the AI Pteranodon being able to cover the ridden individual and give them time to park and regenerate stamina. And if things go south, a hit-and-run strategy can be employed making use of the Pteranodon's speed to get away and small size to hide and recuperate before going in again. Level up Health and Damage for all Pteranodon, then extra Stamina for any ridden individuals while bumping up the rest's damage further. Recommended at least four Pteranodon per squadron. Warning: Do not use near an enemy base until after any turrets are destroyed as otherwise they make for effective anti-air guns. A Pteranodon is capable of carrying smaller creatures. This is done by using the alt-fire button (default rmb) while flying or hovering over the creature. The Pteranodon will swing its legs forward and you will hear a click noise. If the grab was successful, you will be able to see the creature being pulled behind the Pteranodon, as well as its name and level. This is very useful for separating a small, high-level animal such as a Dilo from a pack so that you can tame it elsewhere. To release the creature, press the alt-fire button again. Unlike the Argentavis, the Pteranodon can not attack the creature it is holding. Creatures being carried cannot attack the Pteranodon while carried, but can land a hit when picked up or dropped. Players are the exception to this, and can attack the Pteranodon while being carried, potentially killing it and causing both the victim and the rider to fall. Ultimately, tranquilizing the Pteranodon from the top back of the head with a crossbow or long rifle dart will almost always knock the reptile out in one hit. Tamed Pteranodons will not take off while set to Wander, allowing you to breed them safely without a roof. Having a Pteranodon follow you or a mount at high speeds may be annoying and impractical, as the Pteranodon will easily overtake any other creature. This often causes them to do a circle around you, and get stuck in the walking creature's legs, rendering both creatures immobile. It is recommended to keep a close eye on your Pteranodon's Stamina when flying on its back, as it will force-land if it runs out of Stamina. Compared with the Argentavis they fly quicker, but run out of Stamina much faster. While flying on a Pteranodon in multiplayer mode, beware of auto turret-wielding bases, as they can easily shoot down your Pterandon very quickly. Despite being classed as a carnivore in-game, it is far more likely that the real Pteranodon was piscivorous. Pteranodon wyvernus means "Toothless Wing Wyvern"; however, the ones in the game are portrayed with small sharp teeth. In actual Pteranodons, the females did not have the long head crests that both sexes have in-game. While they are portrayed with a bat-like bony rod supporting the wing, real Pteranodon had no such structures. The skull of the animal shown in the dossier is not of Pteranodon but Caulkicephalus. This indicates there may have been a misnomer. Although Pteranodon was one of the biggest flying animals ever, it could only carry a burden the size and weight of a small child. This page was last edited on 31 March 2019, at 22:29.